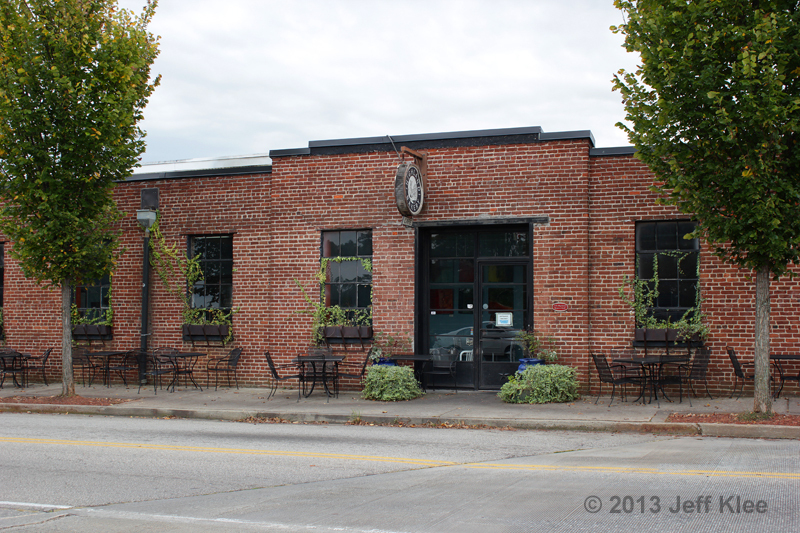 Back in June I highlighted some bakery treats from Highland Bakery in Atlanta. That was just a quick stop after lunch to sample a couple items. Today’s visit was to sit down and enjoy breakfast. It appears that since June, they have improved their rating on TripAdvisor from # 38 to # 28 of 3,353 Atlanta restaurants. The last review didn’t mention parking, and I’d be exaggerating to say it was limited. You are looking at their entire parking lot. 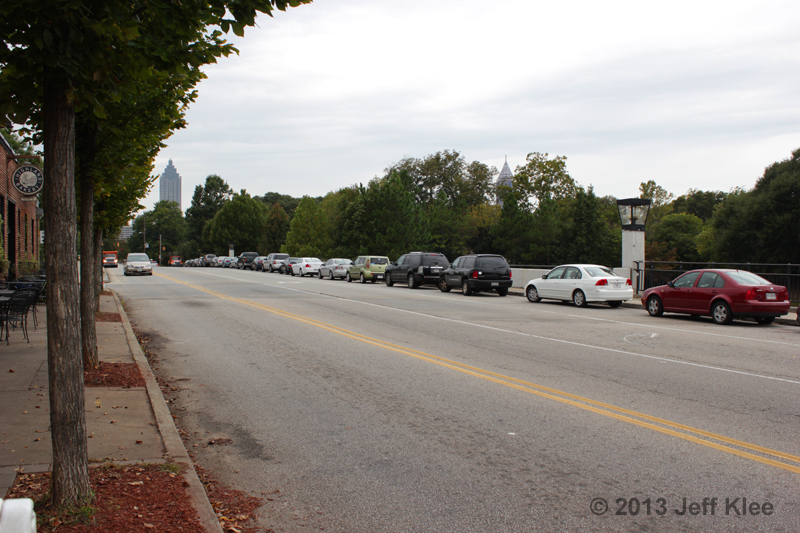 This is slightly remedied by the stretch of street parking along the bridge. 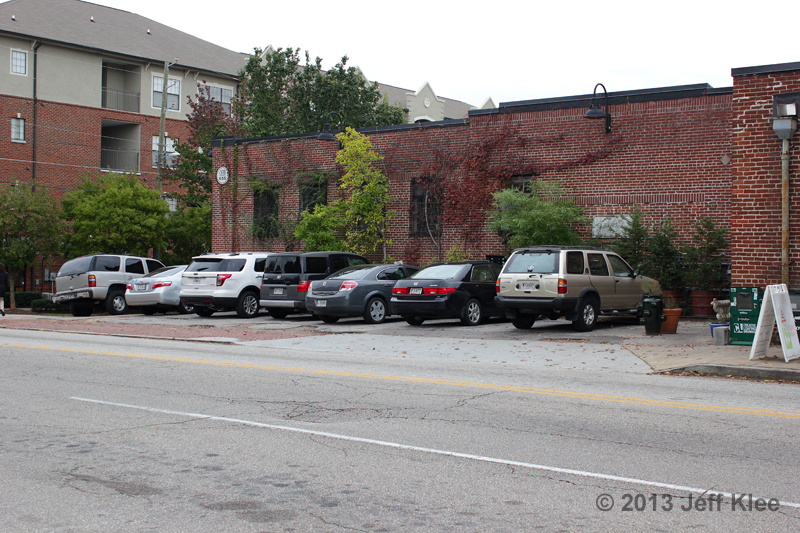 Additional parking can also be found on adjacent streets within a short walk to the restaurant. As much as I love to cover desserts and other bakery items, today it’s all about the meals available. Just past the bakery section is a narrow hallway that leads towards the interior seating in the back. Just as you step past the hostess stand and into that hallway, you’ll see a plexiglass widow looking into a very small room, no bigger than a closet. 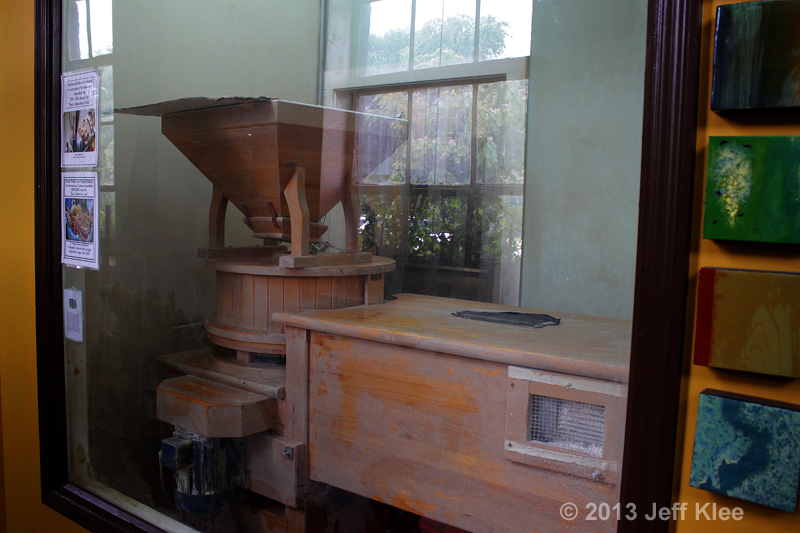 Inside, it contains their very own Austrian grain mill, where they make all their breads in-house daily. This way they can guarantee that their breads and pastries are unrefined, chemical free, and always fresh. 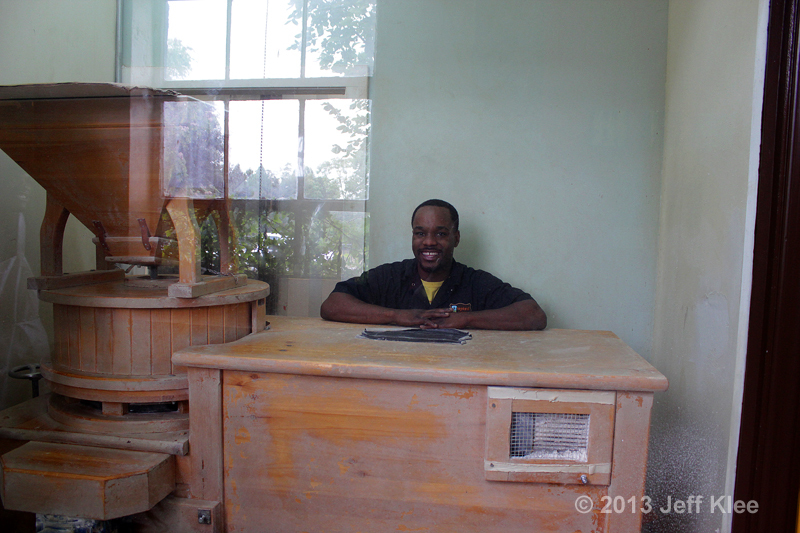 This is one of the employees that does the milling. He was very proud of the work he does and insisted on posing in his little work room. The hallway, which includes a few extra tables, then continues down to the back of the building. 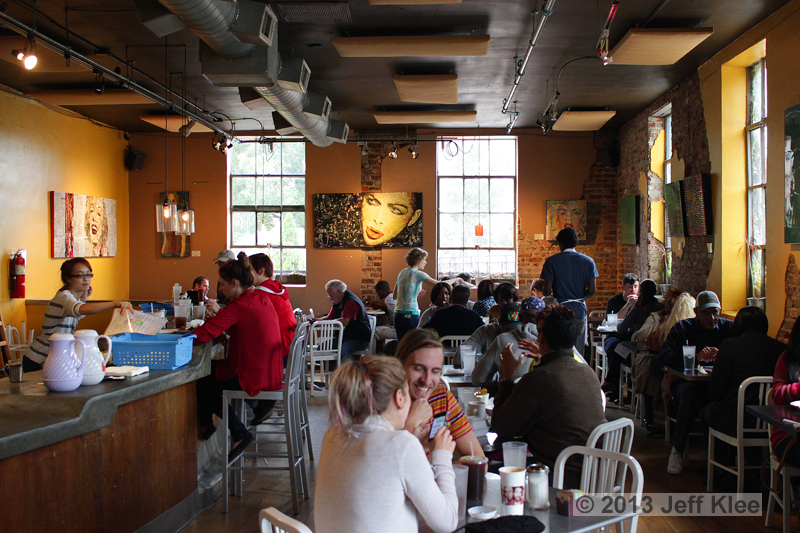 The back room has both counter and table seating. There are a reasonable amount of seats, but the place is very popular, so it can fill up fast. Lucky for us it had finally cooled off for the season, so we decided to grab a table outside. 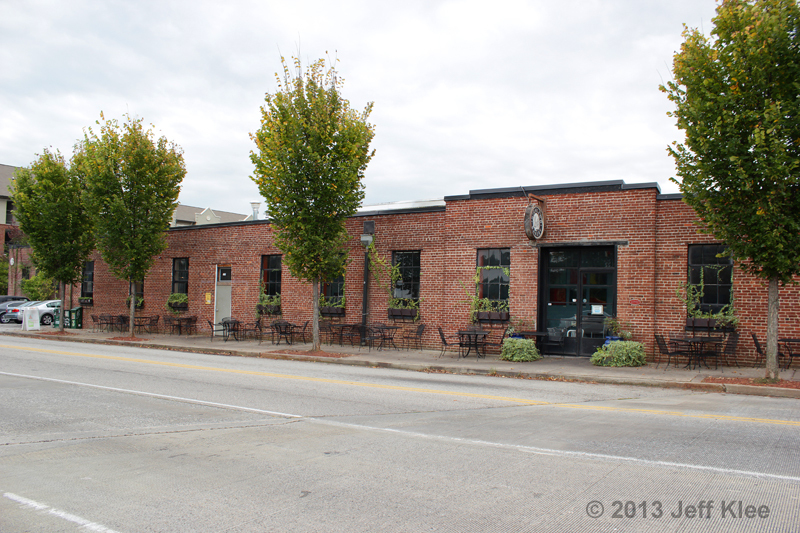 It’s an unusual setting however, as the tables sit alongside the building, right on the sidewalk next to the street. There is enough room for people to walk by, but it’s close enough to the street that as cars passed by doing over 40 mph, we would get a blast of air shot up from the road. This gave me a little concern of having debris and particles from the street blown into my food. The other is for lunch. This side also includes drink options. In my quest to always try different cinnamon buns (future comparison test? ), I had to order the large, $2.99 Cinnamon Roll. My first look had me a bit worried. The bun’s texture had a similar look to the one I had at Radial Cafe. It didn’t look light and flaky. It appeared dense and lacking in cinnamon. I was hoping its looks were deceiving. The first few bites didn’t disappoint. While it wasn’t flaky, it was still delicious. The bun was actually very chewy. I can best describe it as seeming undercooked, although that wasn’t the case. There was no crispiness either. The bun was soft all the way through, and as typical, was made in layers that wrapped around each other to form the circular shape. The cream cheese icing was fantastic. It was the perfect texture. Fluid enough to coat the bun, but stiff enough to not drip off onto the plate, so you can enjoy every last drop. 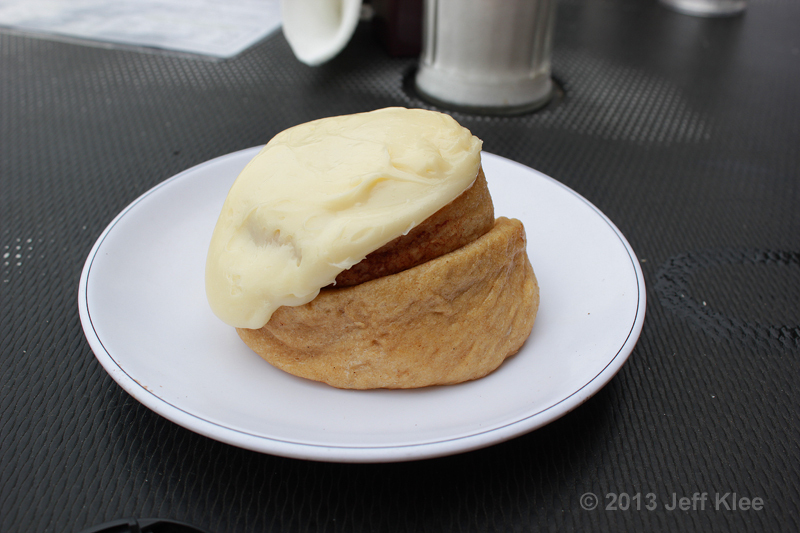 It was sweet, thick, and really complimented the cinnamon flavored bun well. 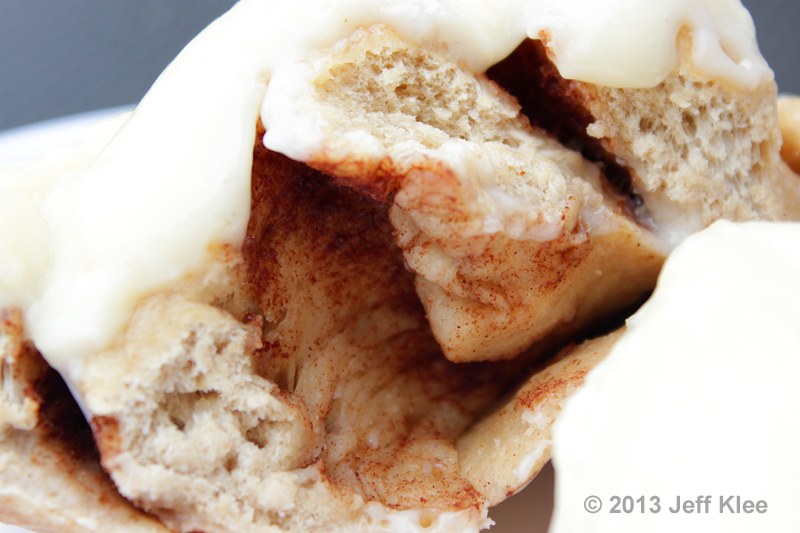 Inside the layers you’ll find just the right amount of cinnamon. 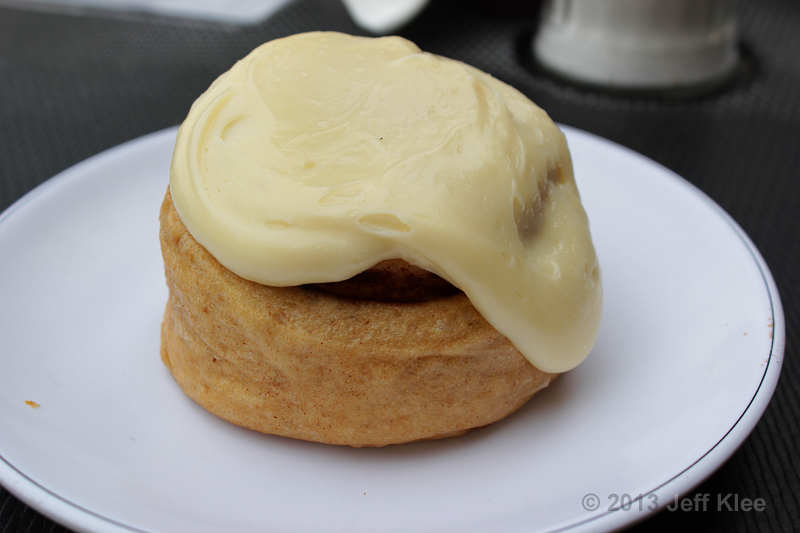 This had all the aspects of a typically great cinnamon bun, with the difference being the bun’s texture. While that part was different, I still enjoyed it. The flavors were great, it was a decent amount of food, and the denser base made it substantially filling. The next plate was the $6.99 Highland Breakfast. It comes with two eggs, which I ordered over-easy. I chose bacon from the other choices of ham, turkey, sausage, or soysage. I also picked potatoes over the other choice of grits. As always, I’ll skip discussing the eggs, as there is little to no change between eggs from one establishment to another. The bacon was better than usual in my opinion. It was crispy the way I like it, but not overdone. They were flavorful (tasted like bacon!) and had little fat, indicating good quality cuts. Just like my last review of City Cafe last week, the potatoes appeared to have been pan-fried in butter. 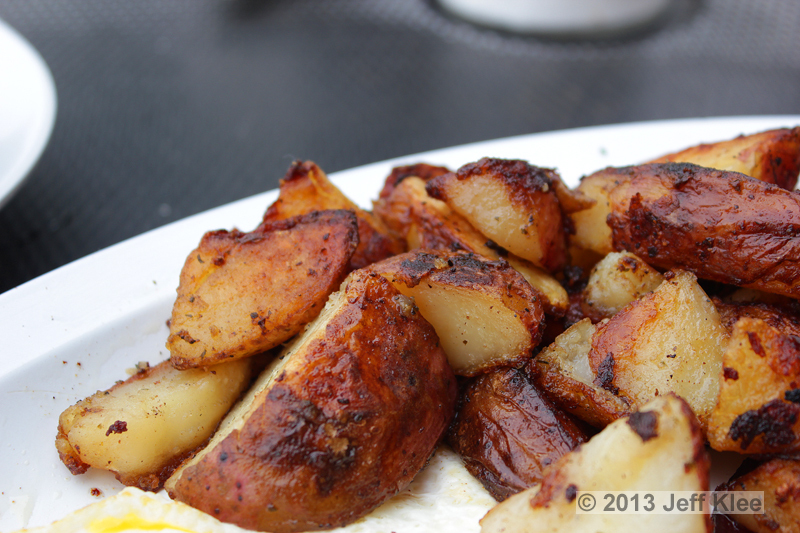 They had a strong buttery flavor, but unlike City Cafe’s potatoes, they had the right amount of salt. There were other unknown seasonings as well that completed this tasty side. 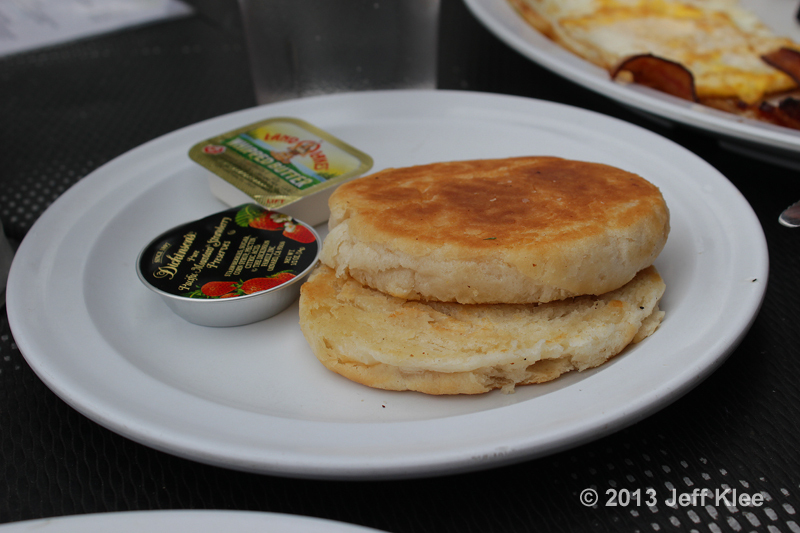 While the menu says the plate comes with toast, they actually give you a choice of toast, bagel, or biscuit. My choice was probably obvious, I went with the biscuit. The biscuit was everything I expect a biscuit to be like. It was soft, flaky, and buttery. The only unusual thing was how flat it was compared to most biscuits that are normally as tall as they are wide. 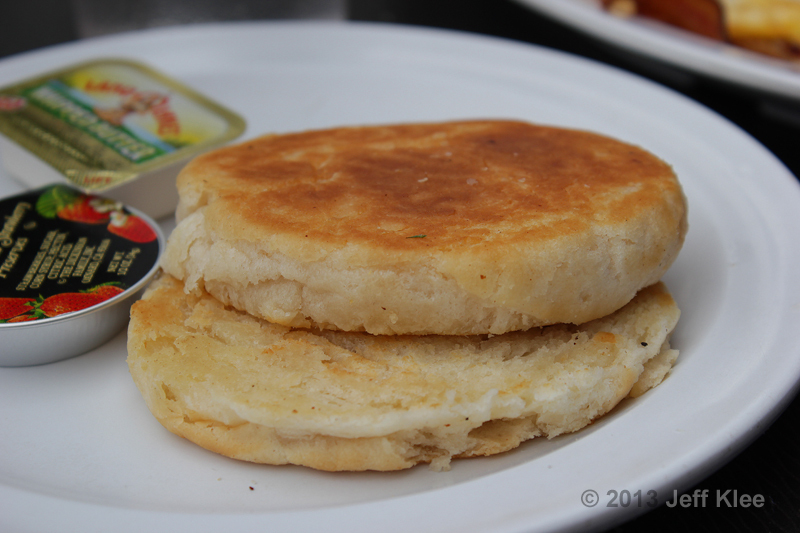 This biscuit did not require any additional butter, but I’m happy to report that it certainly didn’t hurt. 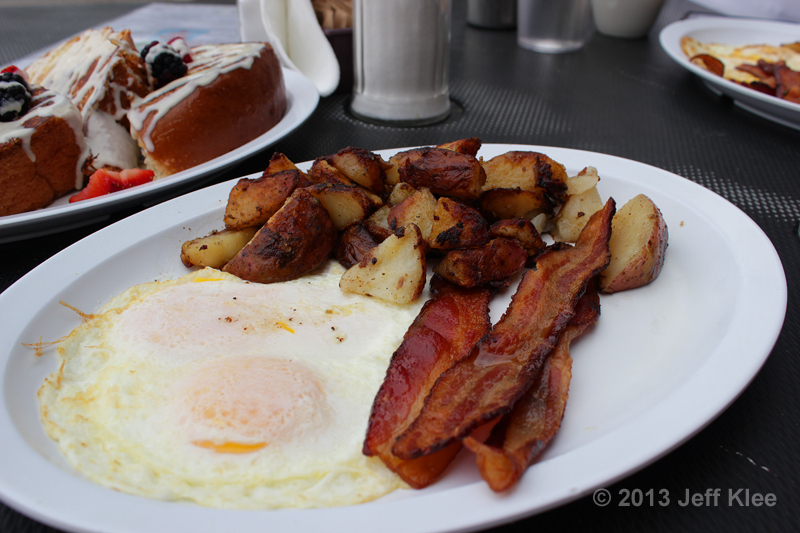 The Highland Breakfast had mostly your standard items including eggs, bacon, potatoes, and bread. 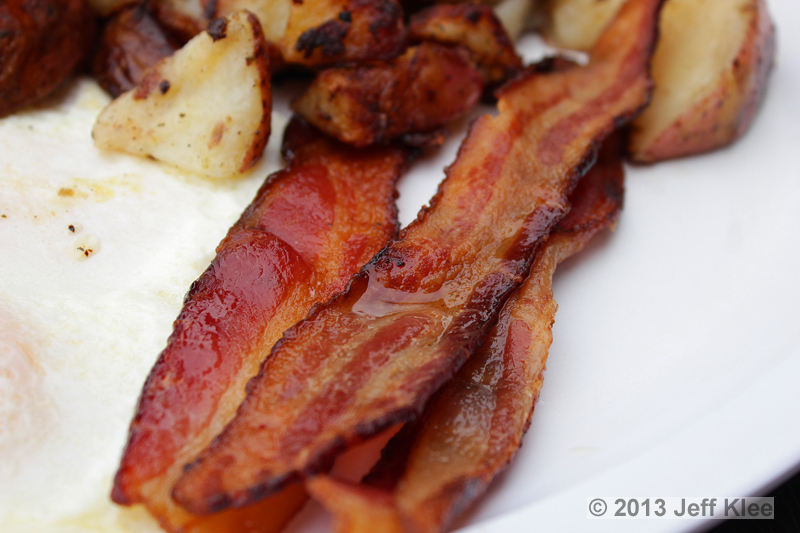 While it was nothing unique, it was all cooked well, and the bacon and potatoes were slightly above average in flavor. Since the biscuit was done properly (by my personal standards) as well, I can recommend this plate a little more. I was in a bagel mood this morning, and when inquiring about that day’s flavors, the server named a cheddar bagel. It sounded like it was worth trying. 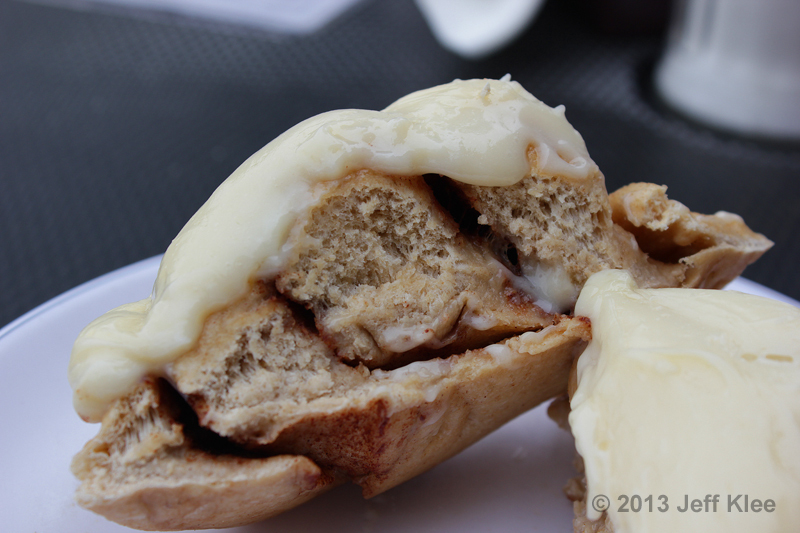 When it was brought out, the toasted bagel was visually a bit of a downer. It wasn’t very big, and like the biscuit, appeared a little flat. However if the biscuit and cinnamon bun were anything to go by, I should have remembered that looks can be deceiving. As it turned out, I was once again too quick to judge. While it was not as perfect as the bagels you get from specialty shops like Bruegger’s or Einstein Bros., it was still surprisingly flavorful. 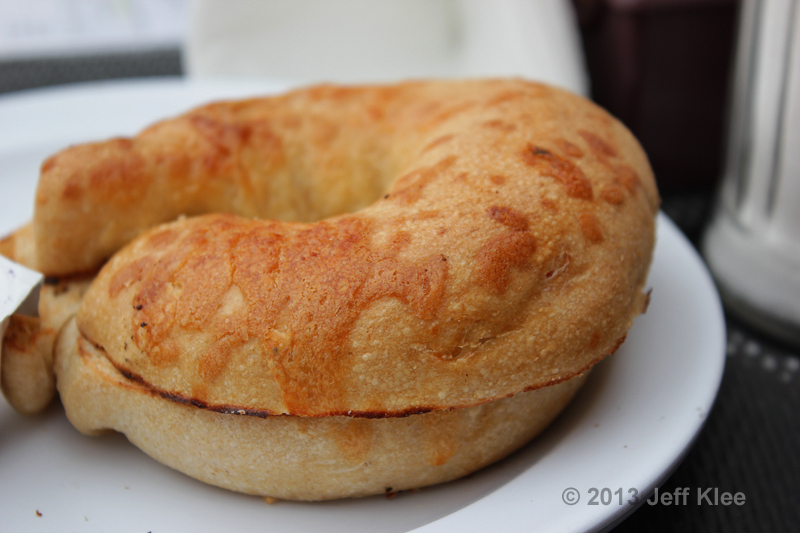 The cheese encrusted over the outer shell of the bagel appears minimal, but it stood out amongst the rest of the dough. The taste of cheddar on a bagel was an interesting change from the common flavor additions of raisins, onion, poppy, or sesame. 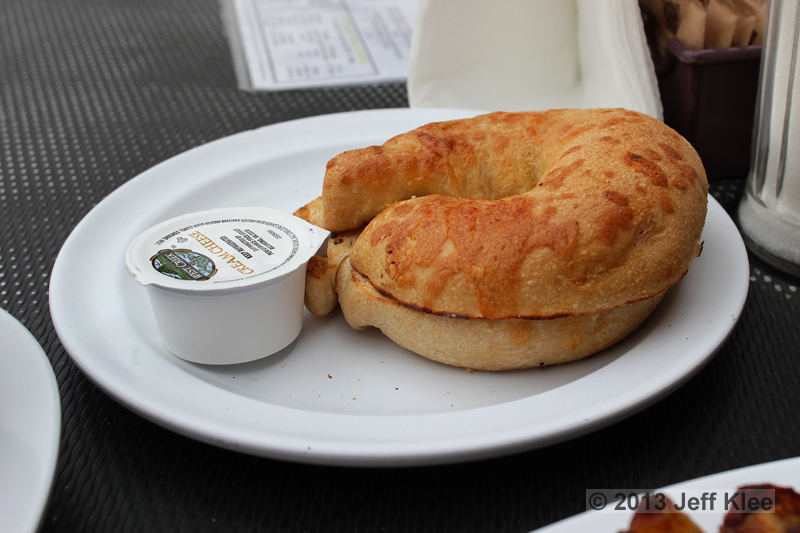 The bagel itself was indeed flatter, but still had a fluffy interior and a crunchy toasted exterior. I noticed a grainy texture that indicated it was house-made. That, among other visual indiscrepancies show that this was not a factory made product. 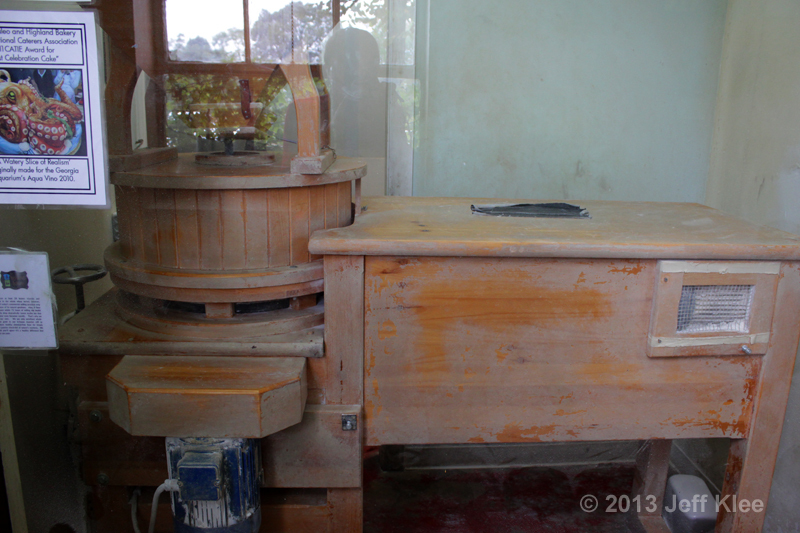 It was most likely one of the many items made on the mill in the hallway. I was happy with this bagel and would order it again. For $1.39 it was really a fairly good deal. The four large pieces of challah (two slices cut in half) were well coated in the French cream, which was a sweet, mostly liquid cream that was similar to melted cinnamon bun icing. It was like a pre-topping that sweetened the toast before I even poured on the syrup. The seasonal fruit most definitely did seem fresh. All the fruit was firm, juicy, and had a lot of flavor. They tasted as if they’d been picked that morning. The brown sugar butter that comes in a small cup on the side is in place of the usual maple syrup. 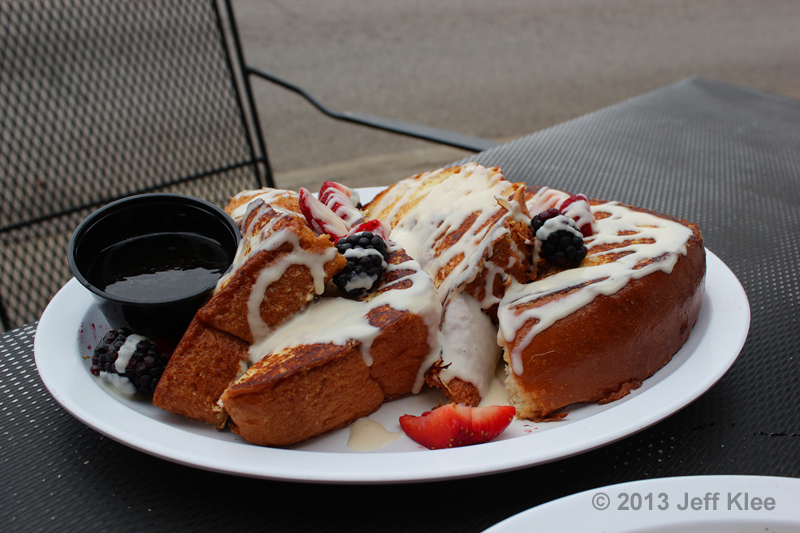 I do have a few issues with the brown sugar butter, seen here once it was emptied over my French toast. 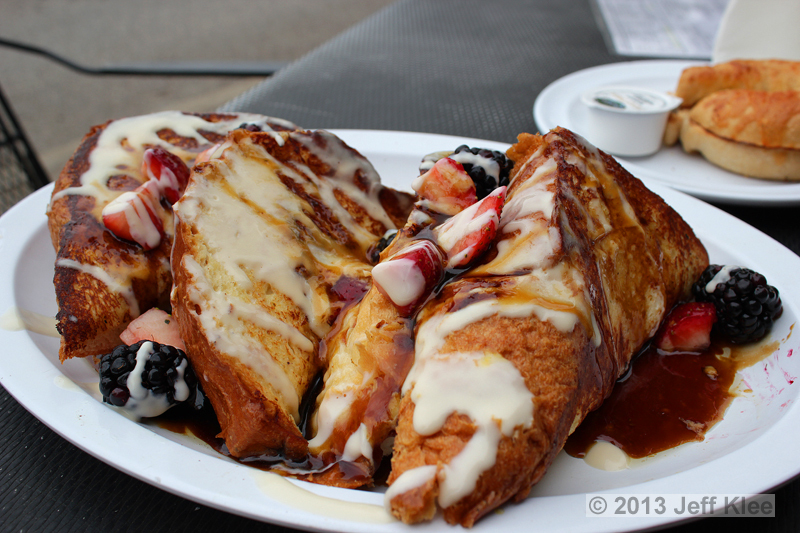 I have had this concoction in the past when I tried the Peanut Butter French Toast on a previous visit (don’t worry, I’ll be sure to review it for you in the future). A mixture of brown sugar and butter sounds amazing to me, but the taste just doesn’t hold up. The taste to me was something like burnt caramel or molasses. It was much more fluid than molasses, but as it sat outside at our table in the 65 degree temperature, the butter caused it to thicken as it cooled. I thought this “syrup” was particular to the peanut butter version of the French toast since that dish has caramelized bananas. That was why I ordered the regular French Toast this time, thinking the difference would be the lack of peanut butter and bananas along with having normal maple syrup. 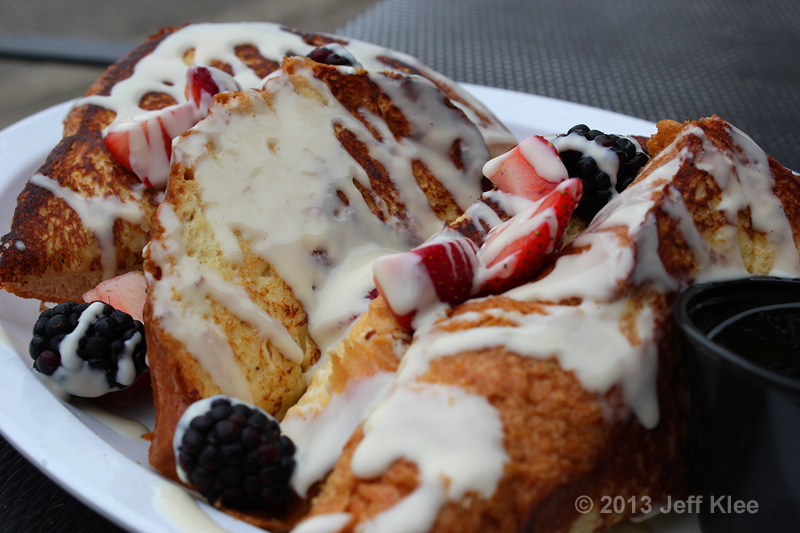 I didn’t realize that this French Toast version would also have the brown sugar butter mix. I gave it the second chance, and still disliked it this time around. It wasn’t until after I had finished my meal that I asked the server about why their “maple syrup” tasted so funny (sometimes I should read these menus more carefully before ordering my food), and I was told what it really was. The best part was that I learned I could request real maple syrup instead. 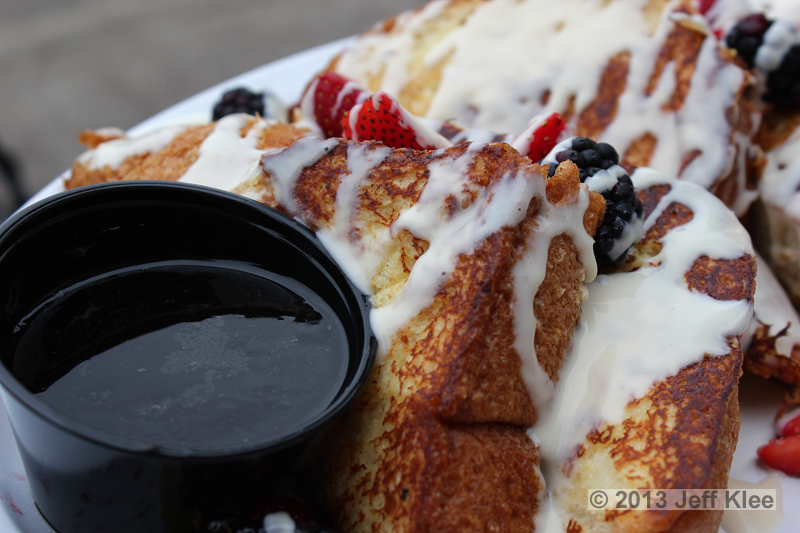 Next visit I will be sharing the Peanut Butter French Toast with you after enjoying it with real syrup. The challah bread was actually very thick. Many places put “thick sliced” on the menu to make it sound better, but Highland Bakery really does not false advertise. The bread is toasted just enough to create a minor crisp on the outside, while easily keeping the inside completely soft and uncooked. 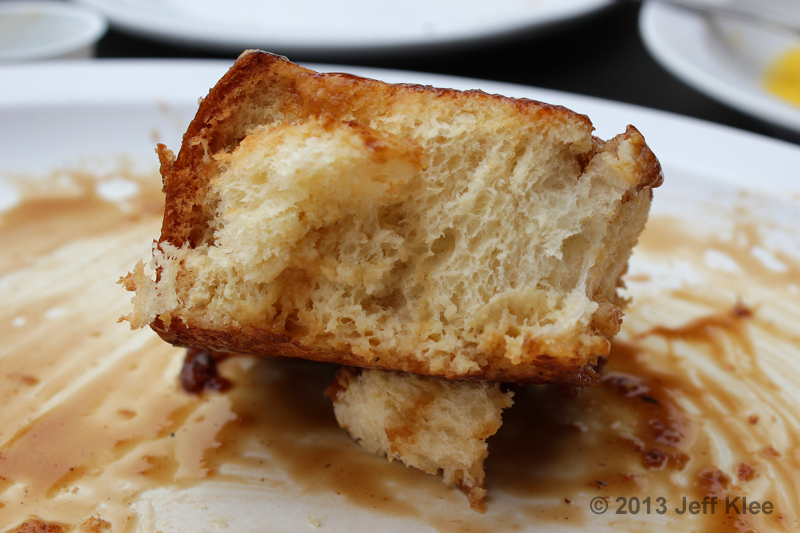 To me, it’s the perfect texture difference I want to see in French toast. Unfortunately the brown sugar butter really brought down my enjoyment of the plate, but it still wasn’t enough to make it unenjoyable. As is probably obvious by now, I’m a fan of most every bakery. With small, yet popular local bakeries, I tend to find even more care goes into the product, and my enjoyment of the food increases. 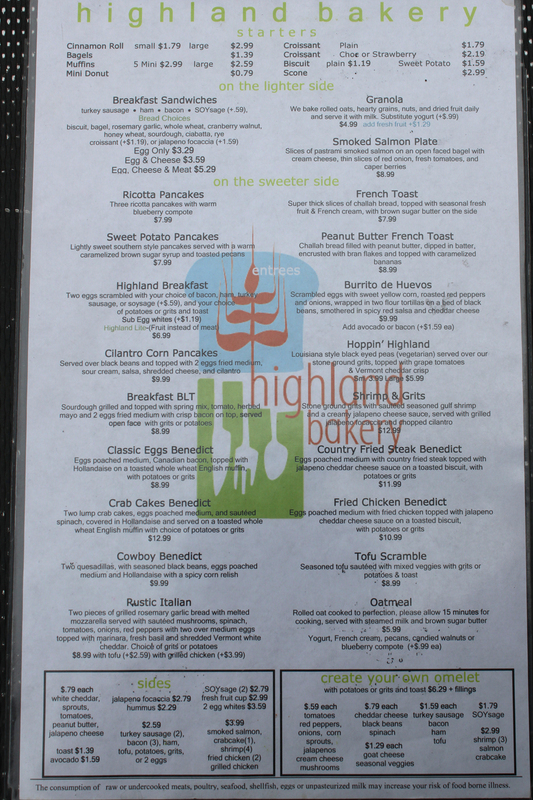 Highland Bakery has not disappointed me in my three visits so far. 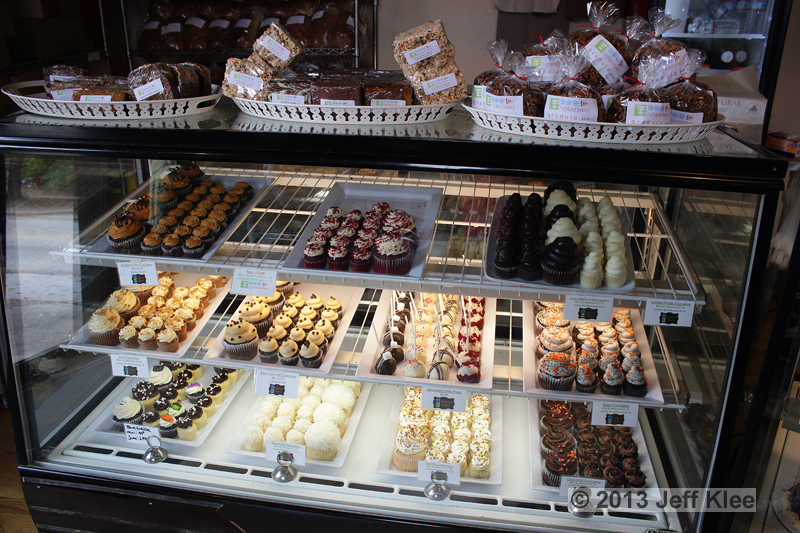 The bakery items are always fresh, delectable, and the meals usually have a unique twist, or at the very least use some of the fresh and sometimes homemade ingredients they have available. 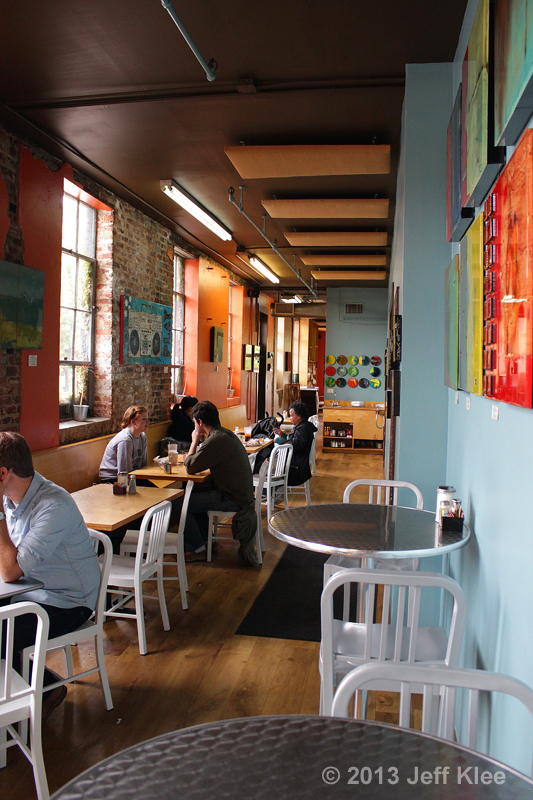 There is a reason this little dual location bakery is rated so high amongst over 3,000 Atlanta restaurants. They have won my affection, and I’m excited for future visits when I can sample more treats. 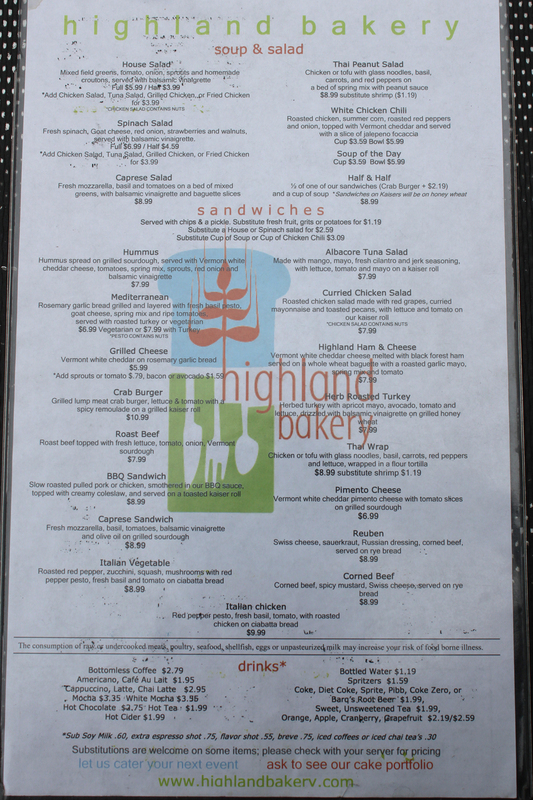 See the next installment for Highland Bakery here.